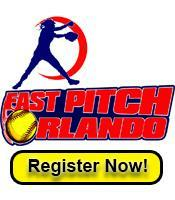 Thank you for your interest in Fast Pitch Orlando (FPO). We very much appreciate your playing in our Tournaments. We are different in many ways from other Softball Tournament Companies. Come play in our Tournaments and "Experience The Difference" and, you too, will see why we are THE FASTEST growing Softball Tournament Company in Florida!! We play TWO games on Saturday and TWO or MORE games on Sunday. The first two games on Saturday are your seeding games. The FIRST game on Sunday determines which Bracket you will compete in. Once your Bracket is determined, you will begin a Single Elimination Tournament within your Bracket. This format allows for and produces the BEST competition at all levels. If you are a strong experienced team you will be in a Bracket with like teams. If you are a newer team you will be in a Bracket with newer teams. This way all of the girls are being challenged and learning. ALL FPO GAMES HAVE TWO UMPIRES! !